Cooking in porous clay pots is probably one of the best ways to prepare healthy low fat foods rich in nutrients and flavors. No fat or oil is required when you cook with a porous clay pot. The pot is first soaked in water for a few minutes. This fills the pores of the clay with humidity that is released in the form of steam when the covered pot is heated in the oven. So nothing sticks to the bottom or the walls of the pot during cooking, and the foods cook in their own juices. Also, because there is very little dilution, the flavors and healthy nutrients stay in the pot. Often porous clay pots are glazed on heir bottom for easy cleaning. Römertopf is the indisputable market leader in such clay pots, The brand name simply means "Roman pot" and was adopted because of the similar type of clay pots used by the Romans centuries ago. More than twenty million Römertopf pots have been produced and sold since their first introduction, and this has allowed people around the world to experience the healthy and easy way of cooking. We will explain below how the Römertopf pots enable the preparation of flavor rich healthy dishes. We will also give important proper usage instructions and provide you with the opportunity to get your own Römertopf on Amazon, if you are interested. 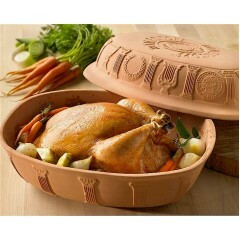 Before use, it is necessary to soak the Römertopf clay pot, including cover, in cold water for about 10 minutes. This allows the water to fill the pores of the clay. Then, you just pat dry the inside of the pot, introduce the prepared vegetables, meat, fish or other foods, put the lid on, place the covered pot in a cold oven and turn on the oven to a temperature not exceeding 200 °C (or 392 °F). As the temperature inside the oven rises, the clay forming the pot radiates heat, and the water absorbed by the clay during soaking is turned into steam. So the food cooks at moderate temperature in the steam trapped inside the pan. This type of cooking preserves flavors and healthy ingredients exceptionally well since they can not escape from the sealed container. Also, the moderate temperature alters them less, and there is very little dilution since hardly any liquid is used. So the combined factors of humidity, low temperature, and longer cooking achieves richly flavored healthy foods at perfect tenderness. Because, unlike other types of cooking, there is no need here to add fat to prevent food from sticking to the bottom and walls of the pot, there is much less fat burned during cooking. This gave the Römertopf pots the reputation of "healthy" cookware. Healthy, low fat, and nutrient rich cooking. Clean cooking that does not dirty the oven and does not require close monitoring. Very low risk of inadvertently burning the food. - Soak the pot and the lid about 10 minutes before use. - Always start cooking by placing the Römertopf pot into a cold oven and never place the clay pot on an active stove top (gaz or electric). - Make sure ingredients are not frozen or very cold before putting them into a hot Römertopf pot. - Avoid using detergents when washing as they could be absorbed by the pores of the clay pot. Use warm water with a brush or cloth to clean. Never scour your Römertopf. 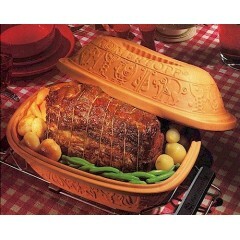 - Store with the lid resting upside down in the base. 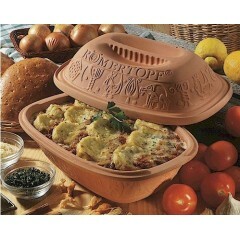 Please select a Römertopf clay pot below to check the price and product info or to purchase.